This app is currently unavailable. Hear the mice and kick them back because they also come in the dark. Detect them by the noises they make and catch them! A Blind mode puts your sense of hearing to the test. MouseKick is a new challenge every day. Accept it and win trophies. MouseKick supports Game Center. Thus, you can easily compare your results with those of your friends and all other players. Load this gaming fun and challenge to your iPhone, iPad, or iPod touch! The mice are coming! Three game modes require different kicking strategies. In Blind mode, mice can only be detected by the noises they make. There is a training mode for learning their noises. Every day a new challenge with the Game of the Day and the option to win trophies. Compare your results with those of friends and all other players via Game Center. Full voiceover support in all modes. 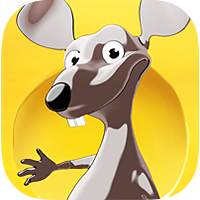 MouseKick runs on iPhone, iPad, and iPod touch, iOS version 6.0 or later. MouseKick offers three game modes and a Blind mode where you can find and kick the mice only by hearing them. In the „Kick them all“ mode, you have to hit any mouse coming out of the cheese and kick it back before it gets in again. Otherwise, game is over. But stop! Not all of them. Leave the black ones alone. While one kick is enough for grey mice, you need a double kick for the white ones. They will reward you with double scores, in turn. You can play „Kick them all“ on three levels. The more difficult it is, the faster the mice get back into the cheese, but the more scores you’ll attain. In the „Nick Kick“ mode, descending grey mice will steal your cheese. When you kick a black mouse, it will also steal some cheese. As soon as there is no more cheese, game is over. So, kick the grey mice back in order to gain scores, but leave the black ones alone. A white mouse will give you some new cheese if you double-kick it. The „Nick Kick“ mode can also be played on three different levels. Are you really fast? „Time Kick“ is a race against time. A certain number of mice will be presented to you. Kick them as fast as you can once they are all there. Your kicking time per mouse will be the number of scores you get. The mice also come in the dark! Find them only by hearing them and get them anyway. You can play all three game modes in the Blind mode. However, you’d better do some training sessions before in order to train your sense of hearing! Please send your questions, problems, or suggestions to support@visorApps.com or use our Contact form.